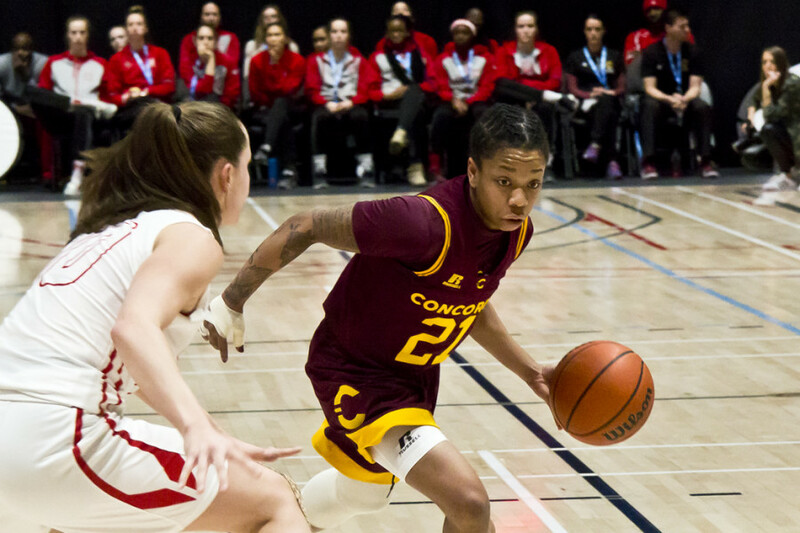 Concordia’s womens’ basketball team’s rendez-vous with the Carleton Ravens was their last of the preseason, and they were looking to complete their exhibition slate without a loss. Early in the game, the Stingers fed off the energy of the home crowd and looked better than their opponent, who happened to finish first in the Ontario University Athletics’ North Division a year ago. The Stingers closed out the first quarter up one point. Concordia’s roster was considerably smaller than Carleton’s, which could have been an issue considering the Ravens could keep their players much fresher throughout the game. Despite that, the home team managed to be very present defensively and offensively during the game. Guard Jazlin Barker, who finished with 12 points and six rebounds, facilitated Concordia’s offence all game long. Of her 12 points, Barker flashed her touch from long-distance, putting in two of her five three-pointers in the game. Carleton showed why they’ll once again be national contenders. They shifted the momentum back to their side and closed out the half up two. After halftime, Barker and forward Ashley Moss helped the team climb back into the game, scoring a combined 13 points in the third quarter. Their contributions helped the Stingers get back in front and they entered the final frame up 44-41. In the fourth quarter, the Stingers went through stretches of sloppy play. Barker and Gittens both mentioned lapses in communication down the stretch leading to their problems late in the game. The Ravens closed out the 55-50 win with consistent free throw shooting and a fourth quarter offensive explosion, led by guard Catherine Traer’s 17 points off the bench. Despite that, Concordia’s lineup appears to be set with Barker and Moss being the two main scoring options for the team. Moss was the Stingers’ leading scorer in the game, finishing with 16 points, five rebounds, four blocks and four steals. The Stingers will open their season at home against the Bishop’s Gaiters on Nov. 9.